The Patient Education Office of the McGill University Health Centre has just released a video to educate the public on the importance of vaccination. And who guides us through the mechanism of action of one of our most effective public health measures? 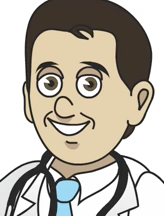 Dr. Christopher Labos… in cartoon form. If you like the video, please send it to your friends and family. You don’t need a Ph.D. to understand it; this is meant to be understood by the population at large. And damn you, Dr. Labos, for getting drawn before me. I’m calling Matt Groening.